Matthew Johll’s Exploring Chemistry overs the standard topics for the nonmajors course in the typical order, but each chapter unfolds in the context of a single case study that helps students connect what they are learning to real-life situations. For example, students work through the often-difficult topics of molecular structure, gas laws, and organic chemistry by learning about the development of powerful new chemotherapy drugs, new technologies for screening airline passengers, and the creation of biodegradable biopolymers. 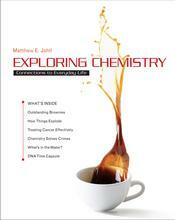 It's the same same case-driven approach that Johll uses in his acclaimed Investigating Chemistry (now in its Third Edition) but Exploring Chemistry goes beyond the other book's specific focus on examples from forensic science to use real-life stories from cooking, athletics, genetics, green chemistry, and more.